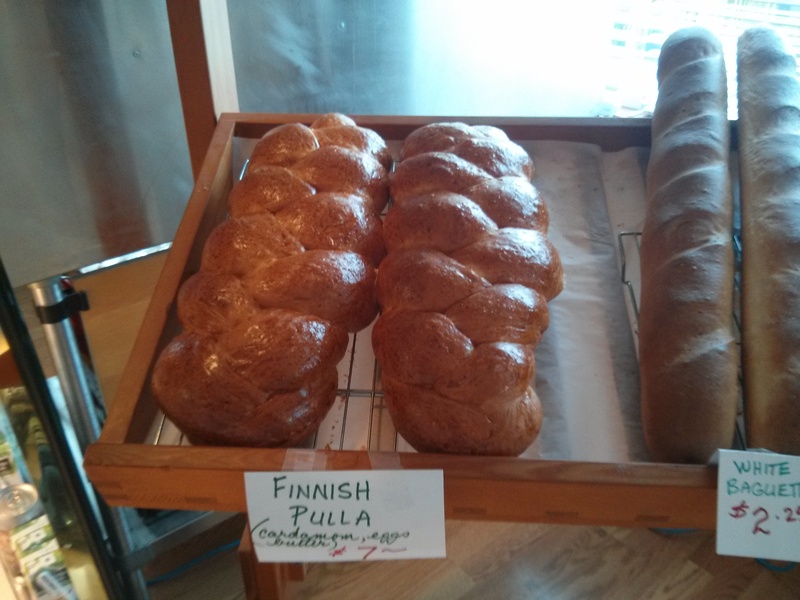 Visited the town of Sointula, Finnish settlement, and the bakery carried Pulla bread, a kind of egg bread with butter and spices which was quite delicious. Not quite sure what the spices were as the blackboard was all in Finnish, just something with many many U’s. We topped up our vegetable supplies at the COOP which is a very good store for that small island with only 692 in residence. The little town is very pretty, with cute cottages with lots of yellow tones as in Scandinavia. One of the fences had a frieze of cut-out squids and another had carved fish. The flowers are all blooming and there are even ripe berries to eat on the side of the road. We got a ride from a kind fisherman in his pick-up and after a talk with another local fisherman, the harbour- master’s husband, we decided to jump across Queen Charlotte Strait despite the contrary flood and high winds. He predicted lumpy, and lumpy we got. But as he says, that’s what we came for! Anyway, it was only a bit over three hours and we are nicely tucked away behind Robinson Island in the Frost Islands in an abandoned old Indian Village called Blunden Harbour. It is sheltered from all sides and despite the pouring rain, it is cozy and quiet. 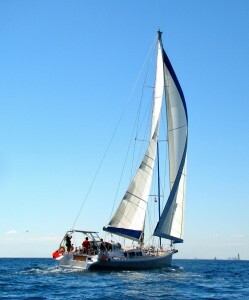 Our biggest problem is that we have been sailing so much, we are having problem re-charging the batteries. This is very unusual and we have to restrict the heater’s running hours, brr…gh. Dinner tonight is sautéed chicken with carrots, onions, snow-peas and an artichoke from Richard Collier’s garden, absolute treat, and a green salad. Photos to come when we have better internet! This entry was posted in The Log and tagged blunden harbour, inside passsage, pulla, sailing, Sointula. Bookmark the permalink. Continue to enjoy reading about the people you meet and their stories. I remember trying to decipher the Finnish on the menu in Helsinki and was only helped by the Swedish also listed (at least it was easier to guess??). I have always held the Queen Charlotte Islands high on my priority list of places to visit. Glad you are getting to see a wonderful BC coast.